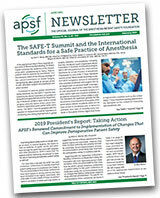 The APSF Newsletter is the official journal of the Anesthesia Patient Safety Foundation. It is widely distributed to a variety of anesthesia professionals, perioperative providers, key industry representatives, and risk managers. It is published three times a year (February, June, and October). Deadlines for each issue are as follows: 1) February Issue: November 15th, 2) June Issue: March 15th, 3) October Issue: July15th. The content of the newsletter typically focuses on anesthesia related perioperative patient safety. Decisions regarding content and acceptance of submissions for publication are the responsibility of the editors. Some submissions may go in future issues, even if the deadline is met. At the discretion of the editors, submissions may be considered for publication on our APSF website and social media pages. Articles submitted that are not in accordance with the following instructions may be returned to the author prior to being reviewed for publication. Please include a title page which includes the submission’s title, author’s full name, affiliations, conflicts of interest statement for each author, and 3-5 keywords suitable for indexing. Please include word count on the title page (not including references). Please include a summary of your submissions (3 – 5 sentences) which can be used on the APSF website as a way to publicize your work. All submissions should be written in Microsoft Word in Times New Roman, doubles spaced, size 12 font. Please include page numbers on the manuscript. References should adhere to the American Medical Association citation style. Example: Bittner E, Banayan JM, Greenberg S. Opioid induced ventilator impairment. Anesthesiology 2017;123:937-960. References should be included as superscript numbers with the manuscript text. Please include in your title page if Endnote or another software tool for references is used in your submission. Review articles or invited pro-con debates are original manuscripts. They should focus on patient safety issues and have appropriate referencing (see link). The articles should be limited to 2,000 words with no more than 25 references. Figures and/or tables are strongly encouraged. Q&A articles are submitted by readers regarding anesthesia patient safety questions to knowledgeable experts or designated consultants to provide a response. The articles should be limited to 750 words. Letters to the editor are welcome and should be limited to 500 words. Please include references when appropriate. Dear SIRS is the “Safety Information Response System.” The purpose of this column is to allow expeditious communication of technology-related safety concerns raised by our readers, with input and response from manufacturers and industry representatives. Dr. Jeffrey Feldman, current chair of the Committee on Technology, oversees the column and coordinates the readers’ inquiries and the response from industry. Invited conference reports summarize clinically relevant anesthesia patient safety topics based on the respective conference discussion. Please limit the word count to less than 1000. Commercial products are not advertised or endorsed by the APSF Newsletter; however, upon exclusive consideration from the editors, articles about certain novel and important safety related technological advances may be published. The authors should have no commercial ties to, or financial interest in, the technology or commercial product. If accepted for publication, copyright for the accepted article is transferred to the APSF. Except for copyright, all other rights such as for patents, procedures, or processes are retained by the author. Permission to reproduce articles, figures, tables, or content from the APSF Newsletter must be obtained from the APSF. Please use metric units whenever possible. Please be aware of HIPAA and avoid using patient name or personal identifiers. Individuals and/or entities interested in submitting material for publication should contact the Editor-in-chief directly at greenberg@apsf.org.